At Libbey Law Offices, we are committed to providing quality legal representation and superior service for each of our valued clients. 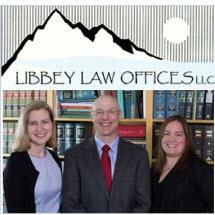 Our attorneys have more than 30 years of combined legal experience representing the seriously injured throughout Alaska. In our personal injury practice, we are strong advocates for people who have been injured by the negligence and wrongdoing of others. We handle a wide range of personal injury claims, including motor vehicle accidents, slip-and-falls and other premises liability claims, construction accidents, aviation accidents and other negligence claims. Our attorneys have recovered millions on behalf of accident victims and have extensive experience in cases involving serious injuries and wrongful death. We also handle a wide range of general law matters, including criminal defense, civil litigation, construction litigation, probate, civil appeals and criminal appeals. As a client of our firm, you will receive highly personalized, accessible and responsive representation. Our attorneys take time to listen to your objectives and put in place legal measures with your needs in mind. As skilled trial lawyers and negotiators, we can provide the vigorous representation you require. From our office in Anchorage, we represent clients throughout Alaska. To schedule a free consultation with an attorney at our firm, call 800-655-9813.